To meet current and anticipated future steam loads, three boilers in the basement of Building 12 were replaced with six newer ones for the generation of 125-PSIG steam for the entire research campus. The project was phased over three years, with one existing boiler being swapped out for two new steam generators each summer. Due to the increased footprint and capacity of the replacement equipment, a new mezzanine was constructed in the building, housing four of the new boilers. 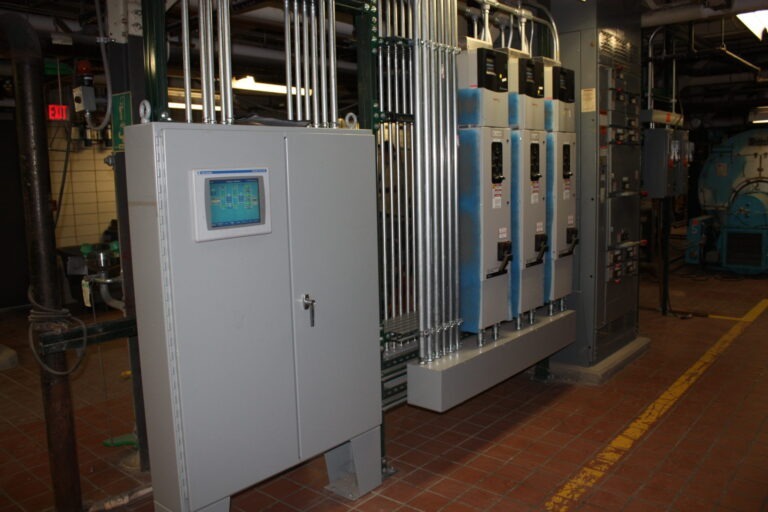 This project also includes the repurposing of two existing generators and the addition of one 500-kW diesel generator with associated switchgear and transfer switches. Existing feed water pumps were replaced, a new surge tank and pumps were added, the water softeners and chemical treatment systems were replaced, and an RO (Reverse Osmosis) system for the feedwater was added. All systems are controlled by a new PLC controls system that communicates to remote monitoring locations through a BacNet interface. Compressed air and combustion air systems were added to the building. HAWA Inc. engineers designed the project entirely using BIM 3D software, including the detailed location and layout of all new and existing equipment, piping, conduit and envelope.